There are a number of very accomplished and personable-seeming guys on the list, as well, but, as we did with this year’s Bachelor contestants, it seemed like we could add some better contestants of our own. So, please enjoy The A.V. 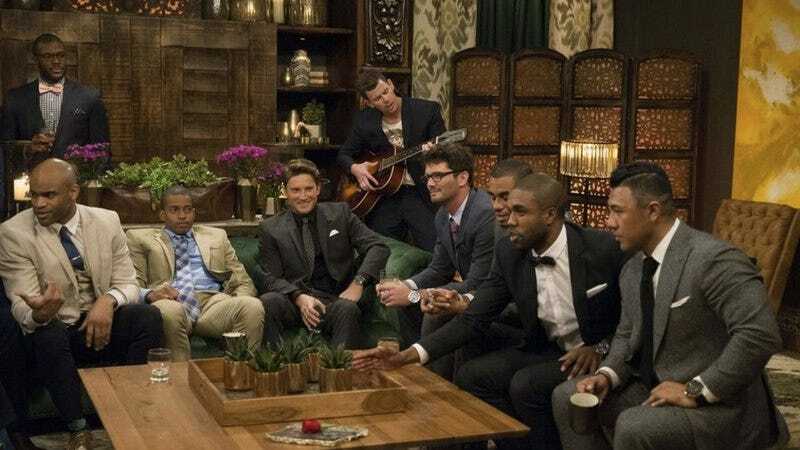 Club’s fictional dream cast of gentlemen for this season of The Bachelorette, because frankly, the males on these shows generally have a habit of making their female counterparts look like the roster of Pulitzer Prize winners from any given year. Blaine, 29, is a real estate developer who bases every building he erects on a different chapter of Atlas Shrugged. Chad, 25, developed an app that automatically generates hilarious bro names. Kevin, 25, is a former X Games competitor who loves The Chainsmokers and gets headaches when adding restaurant bills. Randy, 25, has a tattoo of Elon Musk on his chest, giving him a warm but authoritative thumbs-up. Niles, 34, is the heir to an electric toothbrush fortune. He plans to use his inheritance to start an artisanal wallet-chain company. Dierks, 31, lost on American Ninja Warrior, so here he is. Blake J., 26, is a racist male model who tried to make it in Europe for two months before he bailed out and moved home. Laird, 28, is a former professional surfer who now manages an ayahuasca retreat in Malibu. Arlo, 11, boarded the wrong bus, and continues to wonder when Chess Camp proper will start. Wes, 30, considers himself an alpha male. His preferred cologne is deer musk, which he collects himself. Max, 25, is secretly a masked vigilante known as the Blue Badger. Rod, 29, has been arrested seven times for starting bar fights, and loves Batman V. Superman: Dawn Of Justice. Scoot M., 25, has taken 3 UCB improv classes and is certain America is ready for his wacky stable of characters. Rajit, 26, is a professional EDM DJ who changed his name because he thought it sounded cool. His real name is Joey. David, 32, is an internet entrepreneur who moonlights as a DJ/model. His favorite film is The Boondock Saints. Ryan, 27, just wants everyone to KEEP CALM AND CHIVE ON, bro! Doug G., 26, is the last man in America still playing Pokémon Go. Albert, 128, is a ghost. DeJuan, 28, says he’s just here to become famous, and will therefore make it to the final two. Barnabas, 25, is wholly defined by being a virgin. Cooper is threatened by him. Duane, 29, would be a manager by now if he didn’t get so many boners at work (an actual recurring theme in some of the real contestant’s interviews). The Bachelorette season 13 premieres Monday, May 22 at 8 p.m. ET on ABC.